So What Does It Take To Become A Magician? Not as much “crazy” as you might think? I decided relatively late in life in my late 40s (my VERY late 40s…I was 50 :-P) to take the plunge. And I have not regretted it one bit. My wife? Well that may be another matter :). You can’t do it after a certain age. Let’s talk about all the reasons why this is wrong. First, it might be argued (and indeed, I thought this might be the case) that the physical skills might be hard because of the whole brain plasticity thing. Don’t believe it. Unless you have an existing physical injury, bad arthritis, etc, this is untrue. But my sponsor into the Society of American Magicians – the first magician I talked to once I decided to take the plunge in 2014 – was much like me. He retired form the Air Force in his late 40s, like me. He decided to take up magic AFTER he retired. Like me! He now has a yearly week-long gig at the famed Magic Castle in Los Angeles. Just like…not me:-P. At least not yet. Because I saw that he did it, I was filled with confidence that I could to. So I started down that road. Again, I thought this too. As with any hobby, if you want to be good at it, you’re going to have to put in the time. It already felt like I didn’t have enough time to do the things I was SUPPOSED to be doing. But guess what? It turns out that pretty much everybody feels that way most of the time. If you really want to do something, the time will be there. It’s like….well…magic:). A little time management goes a long way here. Someone on a magic forum said it this way (I’m paraphrasing): It takes 5 years to master the moves. So you’ll be 55. The average life expectancy for an American male who has already reached the age of 50 is 29.5 years. I got that from this interesting site: http://life-span.healthgrove.com/l/51/50). That leaves 24.5 years to perform magic! That also helped sell me on the idea. Magic is not anywhere close to as expensive as most popular hobbies. You don’t have to be a stage magician. Heck, most magicians aren’t doing the big stage illusions with the big machines and boxes, etc. 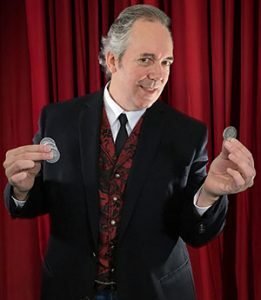 You’ll actually get more joy out of doing magic for people in everyday circumstances – a quick coin trick for a friend or some card tricks at a party, etc. A deck of cards is about $3.00 and coins are, well however much it says on the coin:). Of course, you can get sucked down a rabbit hole if you allow it. I’m not saying that has happened to me. I don’t even look like the guy who lives in this house and has spend way too much money on magic books and DVDS and tricks, etc. :-P.
But seriously – my very first purchase was a pdf of the original Tarbell Course in Magic for $24.50. I already had a deck of cards. And I wanted to have some larger coins than just quarters, so I got 4 Silver dollars from eBay for, well, 4 dollars:-P. And I also got 4 or 5 Kennedy half-dollars for about $3. They aren’t that easy to find. But you can get them on eBay, and some banks still do carry them. You can get also these from the US Mint. But my hands are massive. Most folks can get away with just using quarters. Shortly after that, I realized I was going to REALLY like coin magic. So I was advised to get “Bobo.” That refers to everybody’s recommendation for the first book you should get on coin magic – Modern Coin Magic: 116 Coin Sleights and 236 Coin Tricks (paperback). which is about 10 bucks on Amazon. So you’re off to the races learning magic and you’ve shelled out about $40 bucks! Try getting out of the golf shop or the video game store for that! Since I am still only about half way to that mysterious 5-year point that someone said would be the time I’d have mastered the moves in magic, I figure anyone else wanting to get started – especially if they are older than the typical beginning magician – my experiences should be relevant, valuable, and might even save you time. Welcome to my (and hopefully your) journey to becoming a magician! Ken Theriot (Stage Name: Ken Orion, because it’s my middle name and easier to pronounce”)).